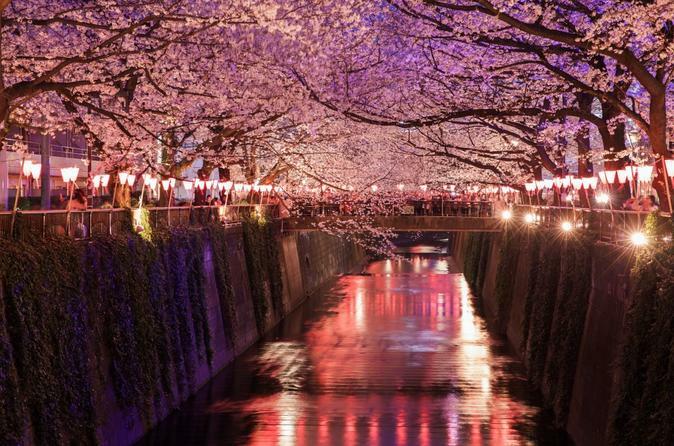 cherry Blossom season in Tokyo is so beautiful, and even more so in the evening when lanterns and lights turn the tree-lined streets into a magical fairyland. Nakameguro is a trendy, beautiful neighborhood, very famous for its 2km route along the Meguro River/Canal. This entire route is lined with cherry trees and it must be seen in person to really get a feeling for how beautiful the sakura (cherry trees) are. Join us on this walking tour along the canal and around the vibrant restaurant and shopping area. Taste local treats and beverages, explore the history of the district, and finish up with dinner at an amazing Udon noodle based pub that features local seasonal dishes, Japanese rice wine and other of course amazing handmade noodles. Sakura season is short, about one month from the first tiny buds to the finish of the season with the peak being about two weeks. It is impossible to predict exact dates each year but we will be offering this limited edition tour in the time period most famous for Hanami time. With our guide, learn about the the area, the meaning and reason behind the sakura season, and taste local specialties that are bound to be pleasing to the eye and to the palate. Nakameguro is a very fashionable district with many small boutiques, and during the sakura season there are lots of stalls selling yummy snacks and streetfood.